Moroso designed their trick front coil springs to ''store'' energy for instant, maximum weight transfer for launching. 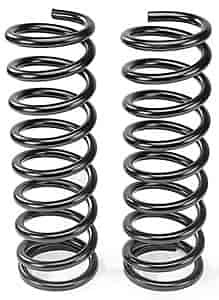 The springs are tall and constructed from small diameter wire to be the correct rate for the particular listed application, although slight trimming may be required to achieve the desired ride height. Sold in pairs. For drag racing only; NOT for street use. Note: To get the desired front end height, it may be necessary to modify the springs. If it is too high it may be lowered by cutting off one-half of a coil Many factors affect the front end height Wheel offset is a major consideration A front wheel offset to the outside will increase leverage of the lower A-frame against the coil spring, and the nose of the car will be lower Disc brake spacers will further affect the height Adding or removing as little as 50 lbs can also make a big difference Take this into consideration when adding a fiberglass hood, aluminum heads, or when putting the battery in the trunk Although these changes will affect the height of the car, the spring rates will be unaffected as long as you stay within the guidelines. * Other GM-built engines can effect front end weight significantly. Weigh front end to ensure proper spring selection. 47150 is rated 5.0 out of 5 by 1. Rated 5 out of 5 by JINX from Exact fit, no problem installation Needed more tire clearance for front wheels, after installing upper and lower tubular "A" arms. Original springs had been cut to lower front end.